General dentistry focuses on the health of your teeth and mouth and it is important for the early detection of any problems. Periodontal (gum) disease is a chronic bacterial infection that affects the gums and bone supporting the teeth. Gum disease is a common oral problem that typically affects people at some point in their lifetime. One of the common sign of gum disease is bleeding gums. Swollen gums, toothache, pus extruding from gums, bad breath, receding gums, loose teeth are all other signs of gum disease. The primary cause of gum inflammation that starts gum disease is plaque – the sticky colorless coating that constantly forms on your teeth and contains bacteria. Gingivitis, the milder form of gum disease, is frequently caused by lack of oral hygiene and results in red, swollen or bleeding gums. You can reverse gingivitis by getting professional dental care and taking better care of your teeth at home, including daily brushing and flossing, eating well and not smoking. Periodontitis is a more serious form of periodontal disease characterized by attachment loss. If untreated, plaque can spread below the gum line, producing toxins and triggering an inflammatory response in the body that causes tissues and bone supporting the teeth to break. When gums separate from the teeth, pockets are formed that become inflamed and deepened with time. Often, this process has very mild symptoms until it results in tooth loss. 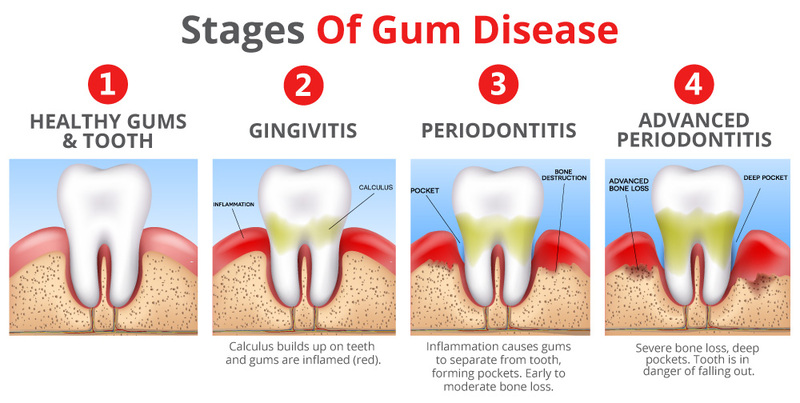 What are the different stages of periodontal disease? 1. Before Periodontal Gum Disease – Gums are healthy and bone structure is firmly in place before periodontal disease occurs. 2. 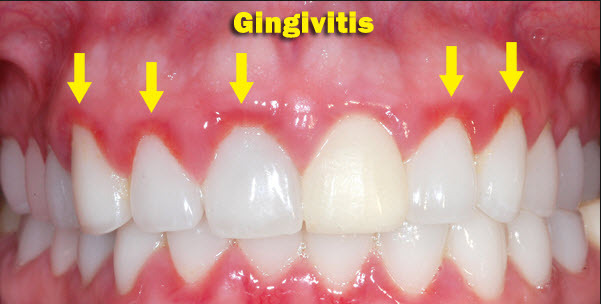 Gingivitis – In this mild stage of periodontal gum disease, the plaque and bacteria has started to irritate and inflame the gums. 3. 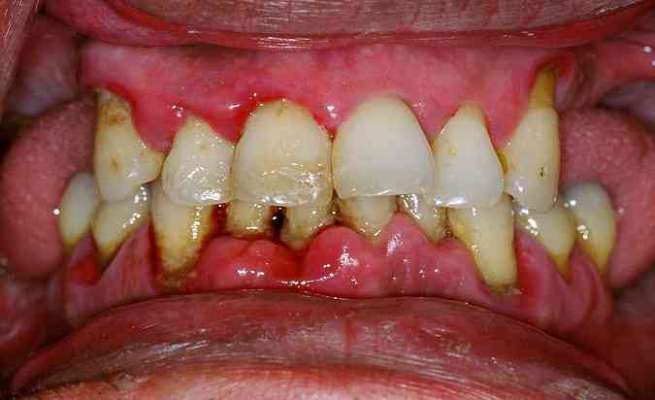 Periodontitis – Gum recession and tartar build-up is the result of untreated periodontal disease. 4. Advanced Periodontitis – As the condition develops even further, the gums start to recede to a point where the bones start to break down. The bone structure will also begin to crumble. Our practice specializes in the prevention, diagnosis and treatment of periodontal disease. Members of our team have had extensive periodontics training and use the latest techniques for diagnosing and treating periodontal disease. 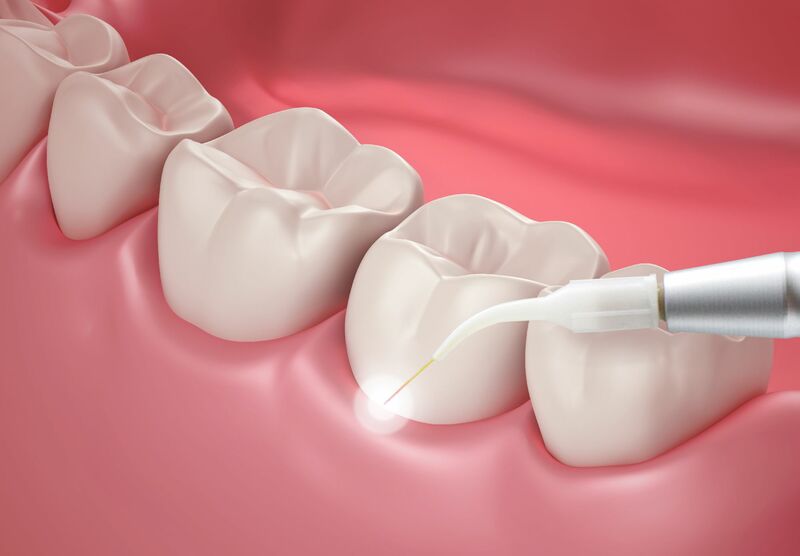 The least invasive and most cost-effective periodontal treatment is a non-surgical procedure called scaling and root planing (SRP). During this procedure, a careful cleaning of the teeth and root surface is performed to remove plaque and tartar from the teeth surfaces. Sometimes, SRP may be followed by local antibiotic treatments, and most patients will need ongoing therapy to maintain oral health. Sometimes, non-surgical therapy is not enough to achieve periodontal health, and in these cases we may recommend surgery to restore teeth and gums damaged by periodontal disease.